The lowly hand file, relied upon since the Stone Age, has been the tool of choice to smooth, hone, clean and deburr all kinds of materials for thousands of years. Records show that ancient civilizations used handmade metal files and stone rasps. Leonardo da Vinci was among the first to design a machine to manufacture files. While da Vinci’s design was unsuccessful, Chopitel produced machine-cut files in France in the 18th century. At that time, files were made of soft iron and heated to harden or carburize the teeth. Looking for a new hand file? 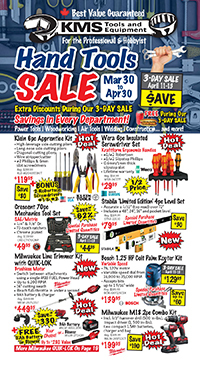 KMS Tools has a great selection. Shop now. Several parts make up a file. The tang is the pointy end. It’s where you attach a wooden or plastic handle. Some files have built-in handles moulded over the tang. Others, like a farmer’s file, have wide, flat tangs that serve as handles. At the base of the tang is the heel. This is where the body of the file begins. The next section is the belly or face, where all the cutting action happens. Some files have more than two bellies or faces, and can feature different tooth patterns on each. Similarly, the edges of a file can be smooth or have teeth. Smooth edges are also called safe edges. Depending on its shape or profile, a file can have flat edges, tapered edges or round edges. Opposite the tang is the point. Strangely enough, the point is often quite square and rarely pointed. Yet the point is, in fact, the end you point at the work. A file’s length is measured from the base of its heel to the end of its point. The tang or handle is not included when determining the length. Most hand files are classified as Swiss Pattern or American Pattern. Swiss Pattern files, on the other hand, are available in seven cuts, ranging in coarseness from ØØ to No. 6, with No. 6 being the finest cut. Made to exacting measurements, these files are smaller and finer than American Pattern files. Swiss Pattern files are usually between 3″ and 6″ long, and are available in a wide range of fine cuts. With teeth that extend to the edge and narrow points for working in tight areas, Swiss Pattern files are ideal for detailed work, often used by jewellers, watchmakers, model makers, and tool and die makers. A file’s face can be single cut or double cut. A single cut file has one set of teeth; a double cut file has two. Some files are single cut on one face and double cut—or even smooth—on the other. Single cut files (top) have one set of teeth. Double cut files have two (bottom). 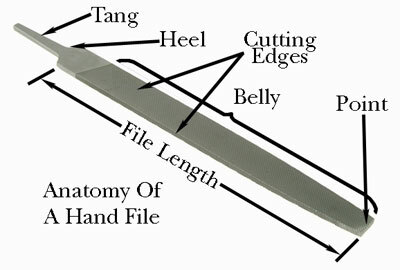 Hand files are also categorized by profile, that is the shape of the file. Examples include flat, round, square, tapered, etc. Although there are numerous sizes, shapes and types, files generally fall into one of the categories listed below. Within these categories, there are standard variations, each with a particular design. Remember, don’t feel limited by the listed applications—use whatever file works for your project. Check out our file identification chart to see how many different files are available. Generally, machinist’s files are double cut for rapid, maximum stock removal. These files are used in numerous applications and on most metals and are available in a variety of profiles and cuts. Saw files are usually single cut to deliver a smoother finish. They are suited to sharpening saw blades and dressing tool edges, especially where a finer, sharper edge or smoother surface finish is desired. These are file-like tools that have been developed over time for specific applications or materials. Examples of special-purpose files include wood rasps, foam files and body filler files. Shape, tooth pattern and other material-specific criteria determine the optimum use for these files. Mini versions of machine and knife files, die sinker files are designed to dress and finish dies. They’re available with tangs for small handles and often come in sets that include a variety of profiles. Somewhat resembling dentists tools, rifflers have uncut middle sections, making them safer and more comfortable to handle. Rifflers have slender, narrow ends to facilitate fine detail work. There are two types of riffler files—die-sinker rifflers and silversmith rifflers, both available in a variety of patterns and shapes. Die-sinker rifflers tend to be smaller and finer—the tools of die-sinkers, jewellers and instrument makers. Silversmith rifflers have longer middle sections and wider ends. 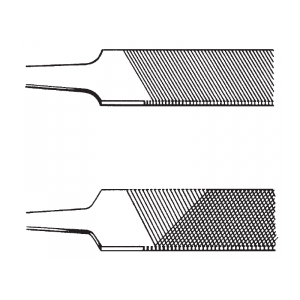 Needle files feature a double cut pattern. Used by jewellers, die makers and other detail craftsmen, needle files come in 12 different shapes and feature long, knurled handles. Because of their diminutive size, some needle files have integrated plastic handles to decrease finger cramping, cuts and abrasions. Filing is an industrial art. It’s not just rubbing the file back and forth. Every stroke should count and move you one step closer to a smooth, polished finish without gouges or abrasion marks. There are three elemental filing techniques. Straight filing is pushing the file lengthwise down the workpiece in a straight or slightly diagonal position. The cutting stroke is the push stroke. Done correctly, the return stroke shouldn’t touch the workpiece. Straight filing can deliver maximum material removal or smooth final finish. Sometimes, the shape of the material can make straight filing difficult or awkward. Draw filing is another popular filing method. This involves holding the file at both the tang and the point, and pulling it across the workpiece towards you. Like straight filing, draw filing can provide maximum material removal or a smooth finish. The third technique is lathe filing and, just as its name implies, is the process of stroking the file against a workpiece that is revolving in a lathe. This can be useful when truing a workpiece or for removing material. As with any application involving your hands and face, and revolving tools, lathe filing requires with much care and attention. Because different metals vary greatly in properties, consider the nature of the metal you’re working with when choosing the right file for the job. Soft, ductile metals require a keen edge and light pressure. Harder materials require duller teeth and more pressure. Tough, dense and abrasive, stainless steel requires a file with good wearing qualities. Apply light pressure and a slow, steady stroke. Soft and difficult to file, aluminum easily clogs. Use an aluminum file, with a special cutting edge that breaks up the filings, prevents over filing, and helps reduce chattering. Apply a shearing stroke to the left for the best finish. Brass is difficult because it’s softer than steel, but tougher and harder than aluminum. Filing brass requires a sharp file with sturdy teeth and a cut that prevents grooving and running. Use a specifically designed brass file, and apply moderate pressure. Wear a Respirator! Soft materials such as lead, babbitt and copper present distinct filing conditions. Use a short, single cut file with stubby teeth. Apply normal pressure. Similar to brass but dependent on the content of alloying elements. Cross the direction of the cutting stroke to avoid grooving. Wrought iron is soft and ductile and does not require a very sharp file for good results. Hard plastic requires a file with high, sharp teeth. Soft plastics are filed in shreds, so a shear tooth file should be used in this application, as well as in other soft materials like aluminum, copper, hard rubber and wood. There are a number of simple steps you can take to ensure your files last a long time. Keep the pressure off. Apply only enough pressure to allow the file to do the work. Feel the teeth biting into the workpiece. Your movement should be fluid and smooth. Applying the correct pressure will also result in the fastest removal of material, even if it takes a few more strokes to get the job done. Soft material such as aluminum can clog cutting teeth, even when you use a file designed for aluminum and soft metals. Protect the teeth. 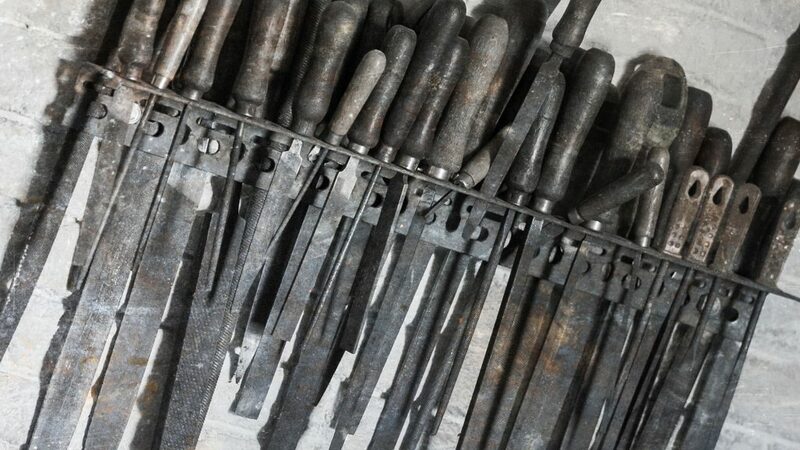 Tossing your files in with all your metal tools is not a good idea! Ideally, hang them up or keep them in a drawer with non-metallic dividers and enough room to fit without a lot of contact. Store them away from water, dirt, grease and filings. Keep it clean and clear. Get a file card and use it while you file and after you’re done. A file card has rows of small, stiff wire that cleans debris from a file’s teeth. Remember that filing creates heat and filings are sharp. Cleaning your file by hand is one way to pick up a metal sliver. Instead, use a file card, which clears away filings before they get stuck in the file—or in your finger. Here’s a handy chart that you can download. It shows the various types of hand files, organized by pattern and profile. Looking for a new hand file? KMS Tools has a great selection. This entry was posted in Archives, Buying Guides, Hand Tools and tagged hand tools by Your Friends in the Tool Business. Bookmark the permalink. Very useful article ! it covered all terms of Hand File Identification & explained in details .Thanks a`lot for providing such a article ,now we re able to identify the hand file by its features . Very helpful, thanks for all the information. I have a small hand file that is really old. It isn’t over 2 1/2 in. Long handle handle to tip. Can you tell me what it is used for. Thanks for dropping a line! Can you post a picture of your mystery file? I have a sizable collection of Swiss pattern files including Grobet, Simonds and Nicholson. How can I ID all of them and find market values for them? Also, where are the best markets to sell them, EBay, Amazon, etc.? I want to sell them at reasonable, fair prices to buyer and seller. Thank you so much for this wonderful tutorial on files and their use. It was just what I needed. Thanks for the updated file. Best one online.